Many thanks to Tracy Johnson, Senior Manager for ENC Marketing & Communications who is the first to send me a photo of the World Wide Rave poster in an office. Tracy, who you can follow on Twitter, is located in McLean, VA. I'm at the printer with Doug Eymer, the world famous designer, who created the wonderful World Wide Rave book design, poster design, and blog design. Doug is a design genius who makes me look good. After the print check, it was really cool to watch the posters come off the printer. Every writer needs a great designer as a partner. Fortunately, I have someone I’ve worked with for more than ten years. The poster will be used to market the book. I'm looking for people to paste them up somewhere fun (in your country, near a famous landmark would be cool). Let me know if you want one and I can send it to you. Here's an example of the poster together with some cool band posters on a street in Zurich. We're living in a time when we can reach the world directly, without having to spend enormous amounts of money on advertising and without investing in huge public relations efforts to convince the media to write (or broadcast) about our products and services. There is a tremendous opportunity right now to reach buyers in a better way: by publishing great content online, content people want to consume and that they are eager to share with their friends, family, and colleagues. One of the coolest phenomena on the Web is that when an idea takes off, it can propel a brand or company to seemingly instant fame and fortune. For free. Creating a World Wide Rave in which other people help to tell your story for you is a way to drive action. One person sends it to another, then that person sends it to yet another, and on and on. Each link in the chain exposes your story to someone new, someone you never had to contact yourself! It's like when you're at a sporting event or concert in a large stadium and somebody starts "the wave". Isn't it amazing that just one person with an idea can convince a group of 50,000 people to join in? Well, you can start a similar wave of interest online, a World Wide Rave. You can create the triggers that get millions of people to tell your stories and spread your ideas. A World Wide Rave! What the heck is that? You're an early bird if you're reading this. Thanks for stopping by! 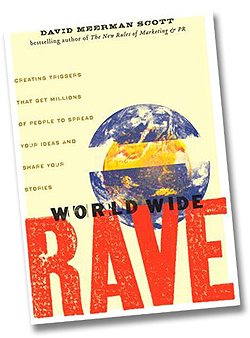 I'm working on the site for my new book World Wide Rave: Creating triggers that get millions of people to spread your ideas and share your stories. A World Wide Rave is when people around the world are talking about you, your company, and your products. Weather you’re located in San Francisco, Dubai, or Reykjavík, it’s when global communities eagerly link to your stuff on the Web. It’s when online buzz drives buyers to your virtual doorstep. And it’s when tons of fans visit your Web site and your blog because they genuinely want to be there. • Nobody cares about your products (except you). • Create triggers that encourage people to share. • Point the world to your (virtual) doorstep.